Silk Tree Nurseries can provide hedging conifers and hedging plants in large quantity - if you require a substantial number of any of our hedging plants, then please email or telephone for a quote. Bays make superb evergreen hedging as they are hardy, evergreen, and easy to care for, with edible leaves that can be used for cooking - they also have a lovely scent as you brush past them! They can be grown in low light to full sun positions, and can even be used indoors in a light position. We are offering some VERY LARGE 10ft inc. pot specimens for instant screening (shown in the photo), also some lovely multi-stem 9litre size. Box is the ideal plant for a classic English formal hedge, it is fully hardy and able to withstand the harshest of winters. It can be planted 12-18inches apart for a hedge, or individual specimens can be used for topiary specimens. Please see our perennials section, click here. Cupressus wilma is a GOLDEN specimen conifer, that naturally grows into a cone shaped column confier. It shines golden yellow, and holds its foliage through the harshest of winters. It is much easier to maintain than the common Box columns you often see, does not suffer from Box diseaeses, and does not 'burn' like Box and other conifers often can. Ideal in a pot, or plant them in your lawn, this specimen conifer will only need clipping once a year to maintain an even shape and this unique form of GOLDEN CONFIER also has a LEMON SCENT when you rub your hands through it or brush against it! These beautiful conifers are fully hardy OUTDOORS all year round, and will be evergreen throughout the winter. The lower photo shows our 4.5ft specimens. Evergreen. The common variety of holly that is an ideal barrier against unwanted visitors to the garden, or can be used in topiary forms. 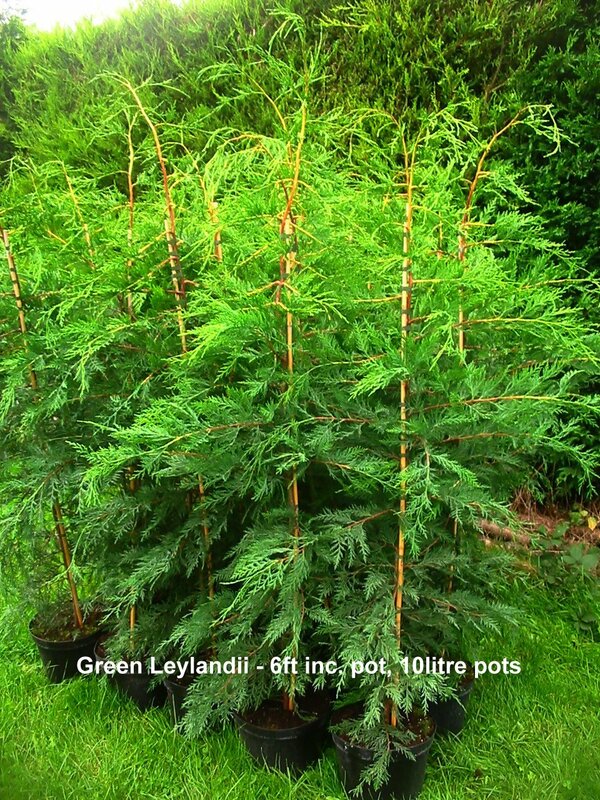 This is not only one of our most popular conifers, but also one of my favourites. Juniper 'Blue Arrow' is a columnar conifer, which means it grows high and slim, making an extremely archetectural specimens. Blue Arrow is VERY straight and narrow, in fact almost as elegant as an Italian Cypress, but with the benefit of having beautiful, shimmering, light blue foliage. This conifer is EVERGREEN, so you will keep this blue foliage all through the depths of Winter - it is totally unaffected by wind, frost, ice - even in a pot. Juniper Sky Rocket is another popular columnar conifer, and , as the name suggests, shoots upwards - slightly faster than Blue Arrow, but easily maintained, growing 1-2ft per year in the ground. Ideal to line a patio or pathway, as a specimen in a pot, or as a formal and sculptural hedge. The photo shows some of the actual stock on offer - these are pot grown specimens which can be planted any time of the year. A superb hedging laurel which can be used as a standalone plant or as a formal hedge which can be tightly clipped. Very hardy and evergreen. Evergreen. Beautiful red Spring foliage. Becoming very popular as an exotic and unusual hedge is the beautiful Photinia Red Robin. This fully hardy EVERGREEN plant grows to only 10ft, and can be clipped to any height to form a dense hedge. The Photinia is grown for its superb Spring foliage of fire red which blazes across each plant for a spectacular display. These plants can be used in the exotic garden as stand alone shrubs and bushes, or can be planted 2-3ft apart to form a hedging screen. The picture shows some of the actual plants on offer. The Portugese Laurel is popular because of its reliability as an evergreen throughout the winter, and its ability to keep its leaves throughout the hardest of winters. Also, this beautiful glossy leaved tree does not seem to be a target for caterpillars and does not suffer chewed leaves in the summer like other Prunus. Pyracantha is grown for its amazing display of autumn berries, as well as for its unique ability to act as a fence against burglars or unwanted animals such as cats, rabbits and dogs! This very easy to care for plant has 1/2 to 1inch thorns all over the branches. It is reliably EVERGREEN, giving interest all year round, with small white flowers in late Spring and in autumn a stunning display of bright scarlet berries which cover the plant from head to toe. Pyracantha can make an effective guard against unwanted visitors, and can be grown as a hedge - or plant back border for an autumn display of red berries. The Leylandii conifer is still the best selling and most popular conifer for screen hedging in the UK today, and deservedly so. This conifer will grow at up to 3ft per year in the ground, and can form a dense hedge in a short space of time. Once they reach your required height, then simply prune them once a year to keep them at this height. They will last 50 years or more in this way. Used as a screening conifer, they can be planted 2-3ft apart. Leylandii are fully hardy anywhere in the UK. The photo to the left shows some of our 10litre gold specimens.